Background: There is a lack of a psychometrically robust bariatric-specific health-related quality of life (HRQOL) tool. Aim: A single centre, prospective study to develop and validate a new bariatric-specific 81-item self-report HRQOL instrument called the Bariatric and Obesity-Specific Survey (BOSS). Materials and Methods: Data were collected from 236 participants. Of these 83 patients were under consideration for bariatric surgery (Group 1) 68 patients had undergone a bariatric procedure (Group 2) and 85 normal healthy participants (Group 3). At baseline, participants were asked to complete the Short Form Health survey (SF-36), Hospital Anxiety and Depression (HADS) scale, Moorehead-Ardelt Quality of life Questionnaire (M-A QoLQ II), and a demographic data sheet. Two weeks following the completion of these five questionnaires, participants were asked to complete BOSS once more along with a feedback sheet. Results: Exploratory factor analysis revealed a multidimensional instrument consisting of 42 items distributed over six domains that addressed various HRQOL aspects and dimensions pertinent to bariatric surgery, and relevant to morbidly obese patients. Further psychometric analysis showed that BOSS has adequate internal consistency reliability (Cronbach α = 0.970), test re-test reliability (ICC = 0.926), construct validity, criterion validity, face validity and acceptability. Conclusion: BOSS thus appears to be a valid and reliable multidimensional instrument that provides a clinically useful and relevant measure to assess HRQOL in patients undergoing bariatric surgery. Objectives: Biased negative studies not only reflect poor research effort but also have an impact on 'patient care' as they prevent further research with similar objectives, leading to potential research areas remaining unexplored. Hence, published 'negative studies' should be methodologically strong. All parameters that may help a reader to judge validity of results and conclusions should be reported in published negative studies. There is a paucity of data on reporting of statistical and methodological parameters in negative studies published in Indian Medical Journals. The present systematic review was designed with an aim to critically evaluate negative studies published in prominent Indian Medical Journals for reporting of statistical and methodological parameters. Design: Systematic review. Materials and Methods: All negative studies published in 15 Science Citation Indexed (SCI) medical journals published from India were included in present study. Investigators involved in the study evaluated all negative studies for the reporting of various parameters. Primary endpoints were reporting of "power" and "confidence interval." Results: Power was reported in 11.8% studies. Confidence interval was reported in 15.7% studies. Majority of parameters like sample size calculation (13.2%), type of sampling method (50.8%), name of statistical tests (49.1%), adjustment of multiple endpoints (1%), post hoc power calculation (2.1%) were reported poorly. 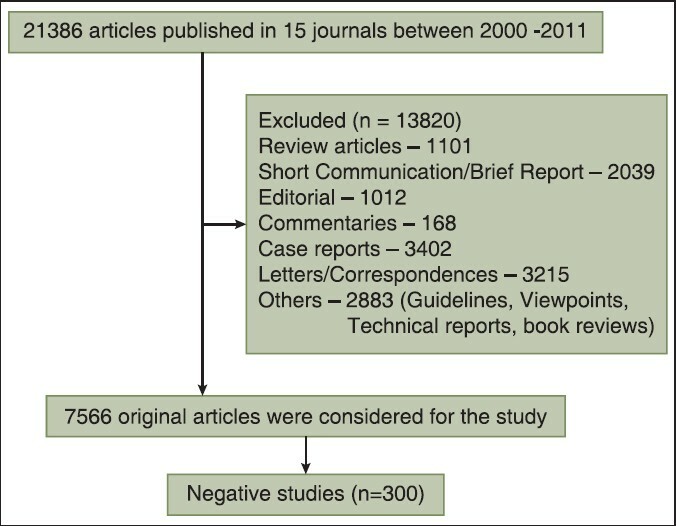 Frequency of reporting was more in clinical trials as compared to other study designs and in journals having impact factor more than 1 as compared to journals having impact factor less than 1. 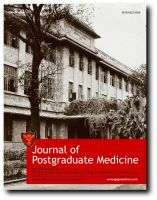 Conclusion: Negative studies published in prominent Indian medical journals do not report statistical and methodological parameters adequately and this may create problems in the critical appraisal of findings reported in these journals by its readers. Background: Recent review of older (≥45-years-old) patients admitted to our trauma center showed that more than one-third were using neuro-psychiatric medications (NPMs) prior to their injury-related admission. Previously published data suggests that use of NPMs may increase patients' risk and severity of injury. We sought to examine the impact of pre-injury NPM use on older trauma patients' morbidity and mortality. Materials and Methods: Retrospective record review included medication regimen characteristics and NPM use (antidepressants-AD, antipsychotics-AP, anxiolytics-AA). Hospital morbidity, mortality, and 90-day survival were examined. 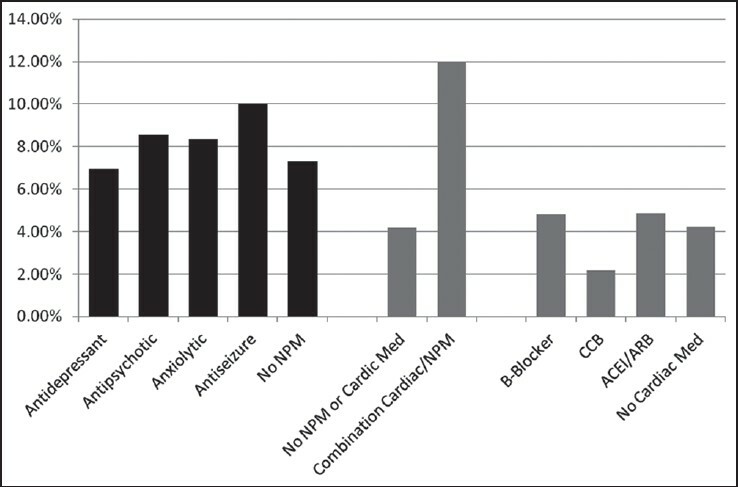 Comparisons included regimens involving NPMs, further focusing on their interactions with various cardiac medications (beta blocker - BB; angiotensin-converting enzyme inhibitor/angiotensin receptor blocker - ACE/ARB; calcium channel blocker - CCB). Results: 712 patient records were reviewed (399 males, mean age 63.5 years, median ISS 8). 245 patients were taking at least 1 NPM: AD (158), AP (35), or AA (108) before injury. There was no effect of NPM monotherapy on hospital mortality. Patients taking ≥3 NPMs had significantly lower 90-day survival compared to patients taking ≤2 NPMs (81% for 3 or more NPMs, 95% for no NPMs, and 89% 1-2 NPMs, P < 0.01). Several AD-cardiac medication (CM) combinations were associated with increased mortality compared to monotherapy with either agent (BB-AD 14.7% mortality versus 7.0% for AD monotherapy or 4.8% BB monotherapy, P < 0.05). Combinations of ACE/ARB-AA were associated with increased mortality compared to ACE/ARB monotherapy (11.5% vs 4.9, P = 0.04). Finally, ACE/ARB-AD co-administration had higher mortality than ACE/ARB monotherapy (13.5% vs 4.9%, P = 0.01). Conclusions: Large proportion of older trauma patients was using pre-injury NPMs. Several regimens involving NPMs and CMs were associated with increased in-hospital mortality. Additionally, use of ≥3 NPMs was associated with lower 90-day survival. Background: Ethyl alcohol exerts both positive and negative effects on the cardiovascular system. Alcoholic cardiomyopathy, produced by direct or indirect mechanisms, is well-documented. An important, but seldom appreciated effect is an increase in iron deposition in the myocardium, which can add to the cardiac dysfunction. The present study was planned to document the pathological features and iron levels in the cardiac tissue of patients who were chronic alcoholics and correlate these characteristics with the liver pathology and iron content. Materials and Methods: An autopsy-based prospective study of 40 consecutive patients compared with ten age matched controls (no history of alcohol intake). 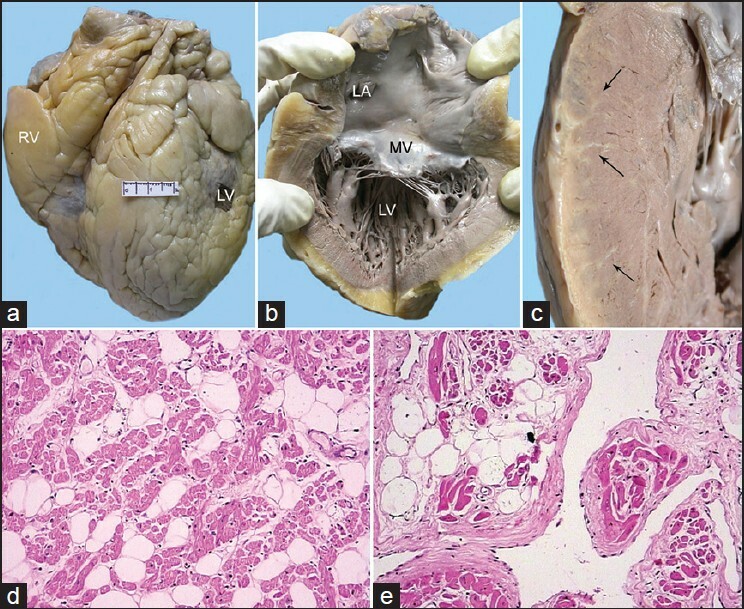 Histopathological changes like the morphology of the cardiac myocytes, degree of fibrosis (interstitial, interfiber, perivascular, and replacement), presence of inflammatory cells, increased capillary network, and adipose tissue deposition were noted and graded. These were also correlated with the liver pathology. The iron content in the heart and liver were measured by using calorimetry. Results: All cases had increased epicardial adipose tissue with epicardial and endocardial fibrosis, prominence of interstitial and interfiber fibrosis, myofiber degeneration, and increased capillary network; this was particularly prominent in patients with cirrhosis. Elemental iron level in heart tissue was raised in the cases relative to controls. Conclusions: Alcohol produces subclinical changes in the myocardium, with an increased iron content, which may be the forerunner for subsequent clinical cardiac dysfunction. Background: Purpose in life (PIL) is defined as the question concerning the significance or importance of life or one's existence. PIL is closely associated with spirituality and, hence, is an important determinant of health. This, in turn, leads to lower stress response and good mental health. Objectives: To assess the PIL and perceived psychosocial stress and to develop a conceptual understanding of the relation between the two. Materials and Methods: A questionnaire was developed to understand the PIL in the cultural context of semi-urban Tamil Nadu. Its internal consistency was checked and it was administered to 227 conveniently selected individuals between 15 and 70 years of age. Results: The questionnaire on PIL developed for this study had an acceptable internal consistency with a Cronbach's alpha of 0.883. Some common purposes in life mentioned by the people were recognition and acknowledgment for their roles and responsibilities, to be a part of a society that is higher class than their current frame, acceptance by people in society, to show people who disagree with them that they are wrong, to be treated with respect, to be known as a person with integrity, love for others, to be beneficial to others at the cost of themselves, to bring equity in the society, and to help others. It was also found that adherence to social norms as a PIL was associated with lower perceived stress. Conclusion: This study provides a conceptual understanding on the purposes in people's lives in the context of semi-urban Tamil Nadu and their association with perceived psychosocial stress. Background: Family members are critical partners in the plan of care for patients both in the hospital and at home. Involving the members of the family in acute care can help the nursing staff in emergency. The present study was aimed to find out the role of the family members while caring for the patients admitted in emergency unit of a tertiary care hospital. Materials and Methods: A total of 400 family members of the patients were conveniently selected. Only one member per family was interviewed and their role in taking care of the patient in acute care setting was evaluated. Results: The mean age of patients admitted in acute care setting was 46.6 yrs ± 18.8 with the age range of 18-84 years. Majority (39%) of the patients were in the age group of 31-60 years. More than half of the caregivers of patients were males and 88% of them were first-degree relatives. The major tasks performed by the caregivers during the patient care was communicating with doctors/ nursing staff (98%), cleaning and dressing the patient (94%), feeding the patient (90%), procuring medication and other supplies (88%), administering oral medications (74%), changing position and helping for back care (65%), shifting the patients for investigations (60%), collecting reports (35%) and providing physiotherapy (25%). Conclusions: The results of the study concluded that family involvement in acute care setting can help the nursing staff in taking care of the patient in acute care setting and it also provides the opportunity for preparing them for after care of the patients at home following discharge. Background: Methicillin-resistant Staphylococcus aureus (MRSA) is the most common multidrug-resistant pathogen causing nosocomial infections across the world. MRSA is not only associated with significant mortality and morbidity but also places a large economic strain on our health care system. MRSA isolates are also typically resistant to multiple, non-β-lactam antibiotics. We conducted a prospective study in a tertiary care hospital, to determine the prevalence of MRSA and to establish the clonal distribution of MRSA isolates recovered from various clinical specimens. Materials and Methods: Clinical samples were cultured and S. aureus was identified as per standard microbiological procedures. Susceptibility testing was done by agar disk diffusion and minimum inhibitory concentration (MIC) method as recommended by CLSI. Methicillin resistance was detected by phenotypic methods namely, oxacillin disc diffusion (ODD), minimum inhibitory concentration (MIC) of oxacillin, cefoxitin disk diffusion (CDD), and MIC of cefoxitin. Amplification of mecA gene by PCR was used as gold standard for detection of methicillin resistance. Pulsed field gel electrophoresis (PFGE) typing was performed for MRSA isolates. Results: Out of 390 S. aureus isolates, 154 (39.48%) isolates were MRSA and 236 (60.51%) isolates were MSSA. Penicillin was the least effective antibacterial drug against the hospital associated S. aureus isolates with 85.64% resistance rate. All the isolates were susceptible to vancomycin. The MRSA showed a high level of resistance to all antimicrobials in general in comparison to the MSSA and the difference was statistically significant (P < 0.05). 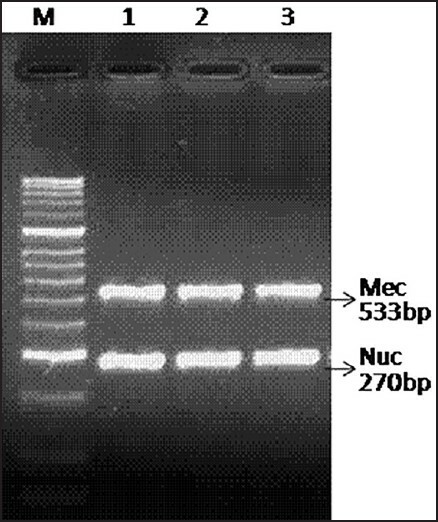 Multiplex PCR performed for all strains showed amplification of both the mecA and nucA genes in MRSA strains whereas MSSA strains showed amplification of only nucA gene. PFGE of these isolates showed 10 different patterns. Conclusion: Prevalence of MRSA in our hospital was 39.48%. Most of these isolates were resistant to erythromycin, clindamycin, cotrimoxazole, and ciprofloxacin, whereas high sensitivity was seen to vancomycin followed by gentamicin. CDD and MIC for cefoxitin showed 100% sensitivity, specificity, PPV and NPV as compared to PCR for mecA gene. In maximum number of isolates PFGE type A pattern was seen suggesting clonal relatedness. 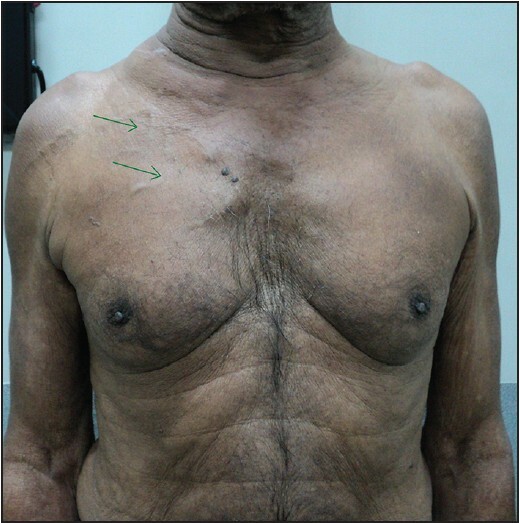 An elderly man presented with clinical features of superior vena cava (SVC) syndrome restricted to the right side. Detailed evaluation suggested the diagnosis of unilateral SVC syndrome due to adenocarcinoma (presumably) from lung. 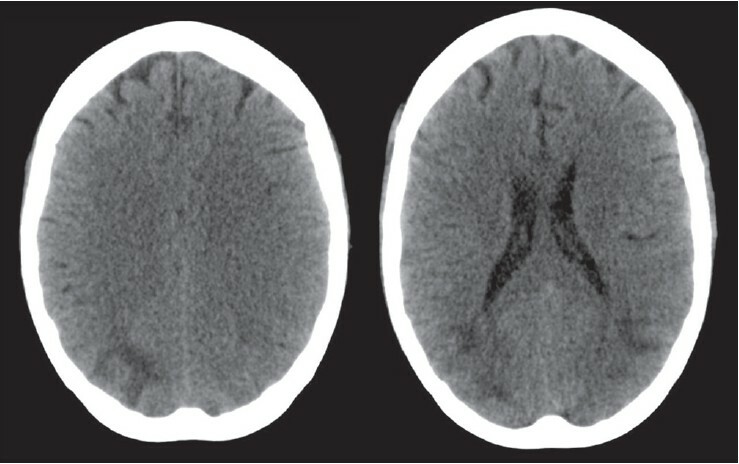 With this case, we discuss the clinical presentation and causes of this rare clinical entity. Also, unilateral signs of SVC syndrome warrant a thorough clinical evaluation as it can be a presenting feature of a spectrum of diseases ranging from benign to malignant etiologies. Coarctation of the aorta is a congenital anomaly of the thoracic aorta with many known associations. We describe the case of a young man referred for management of subarachnoid hemorrhage, in whom subsequent work-up revealed the previously undescribed combination of severe postductal aortic coarctation and an absent segment of the proximal right subclavian artery. 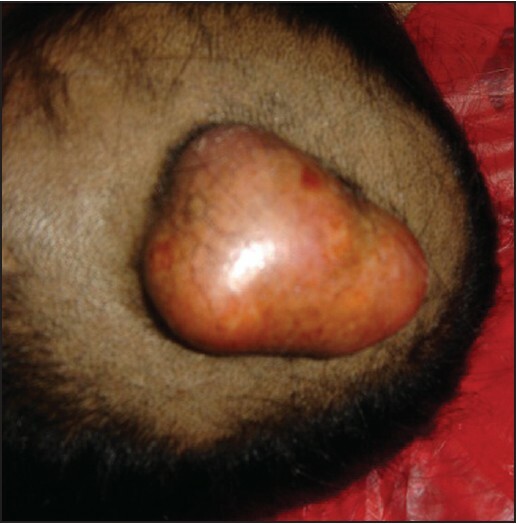 Malignant proliferating trichilemmal tumor (MPTT) is a rare cutaneous tumor predominantly affecting the scalp, eyelids, neck and face of elderly women. 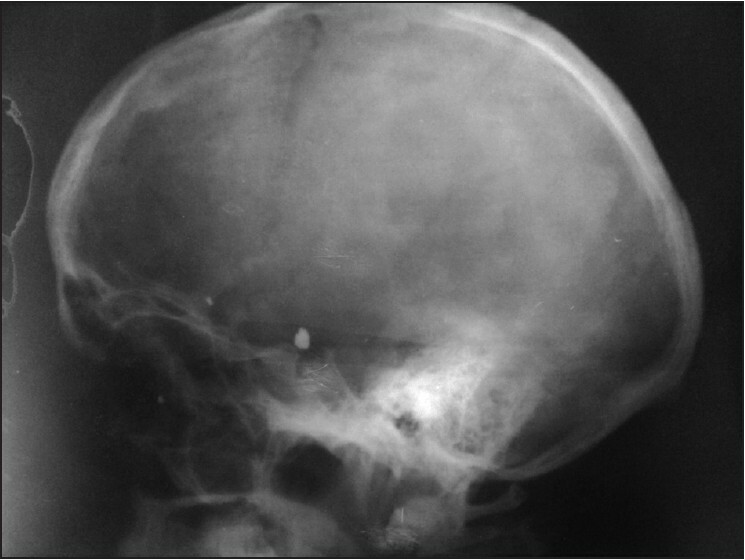 It is a large, solitary, multilobulated lesion that may arise within a pilar cyst. 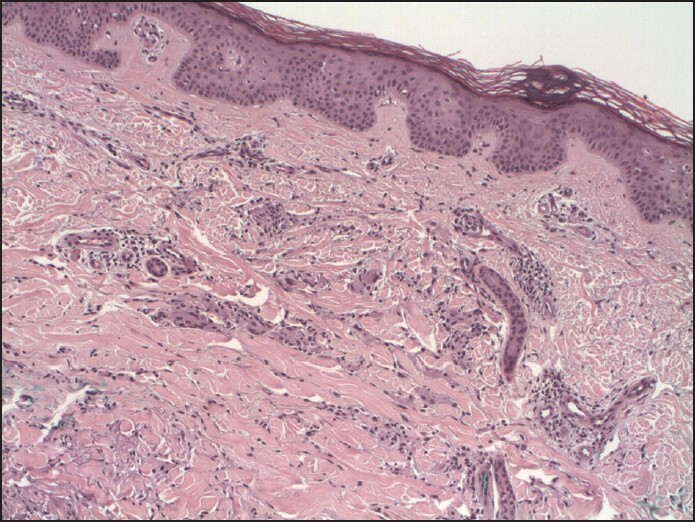 These tumors are largely benign, often cystic, and are characterized by trichilemmal keratinization. However, at times, the tumor has an aggressive clinical course and a propensity for nodal and distant metastases. Wide local excision with a 1 cm margin of normal tissue is the treatment of choice. Adjuvant chemotherapy and radiotherapy have been occasionally used to prevent recurrence in MPTT. 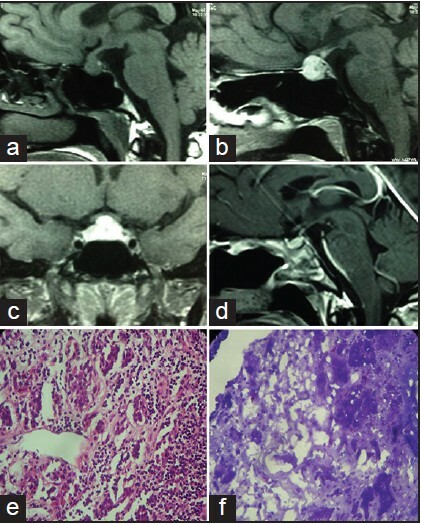 This is a case report of a recurrent malignant trichilemmal tumor over scalp in a young female patient with nodal metastasis. Tumor-to-tumor metastasis (T2Tmets) is an established entity but often overlooked and underdiagnosed. Merely 84 such cases are reported in literature till date. 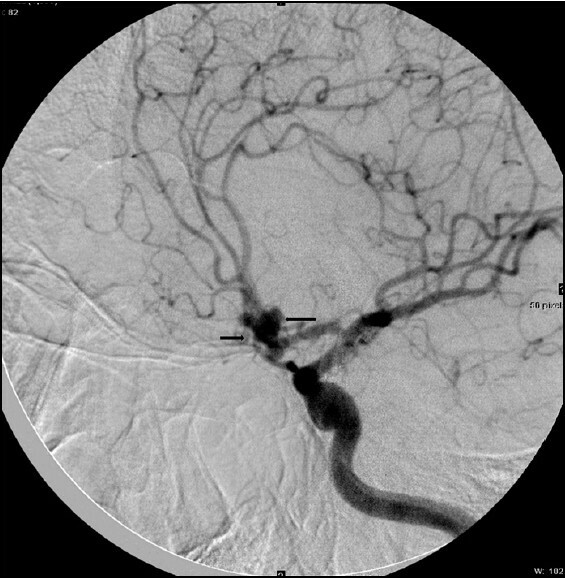 The authors here describe a 65-year-old man presenting with first episode of focal seizure and incidentally turned out to be a case of adenocarcinoma of lung metastatic to a meningioma. The diagnosis of T2Tmets was based solely on histopathological criteria. 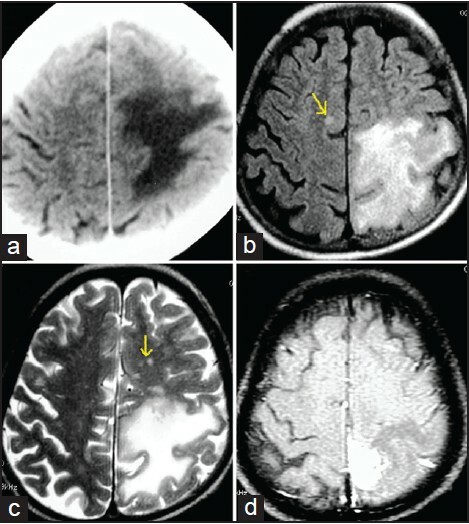 Recent advent of brain imaging revolutionized its diagnosis and it has moved from the realm of thologists to that of radiologists. In our case, diagnosis was also established by immunohistochemistry. Granuloma annulare is a benign inflammatory dermatosis. Cell-mediated immunity and delayed hypersensitivity are proposed pathogenic mechanisms. 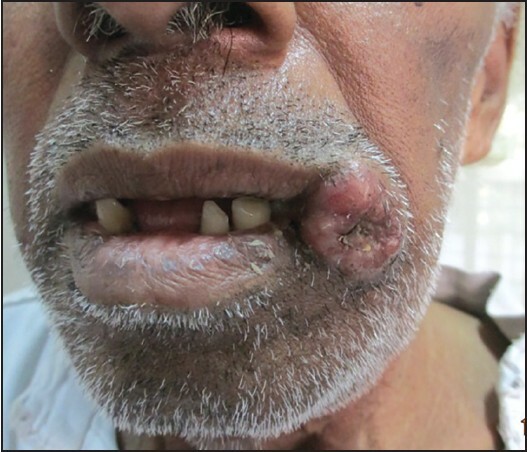 We report in this paper a case of generalized granuloma annulare that resolved after the patient was treated with rituximab and bendamustine for stage IV follicular lymphoma. Tuberculosis of the central nervous system (CNS) accounts for approximately 1% of all cases of tuberculosis and half of these involve the spine. Intramedullary involvement is rare in tuberculosis and usually present in the form of radiculomyelitis, transverse myelitis, intraspinal granulomas, or thrombosis of anterior spinal artery. Transverse myelitis typically extends two or less spinal segments, whereas longitudinal extensive transverse myelitis (LETM) extends three or more spinal segments in length and may occasionally span all the segments of the spinal cord. LETM is most frequently associated with neuromyelitis optica (NMO). Moreover, associations between NMO and active pulmonary tuberculosis have been suggested by a number of case reports and case series. We present here four cases of spinal tuberculosis that presented with LETM and none of them had a clinical profile fulfilling the diagnostic criteria for NMO.